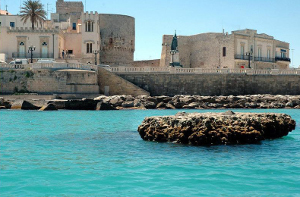 A magic and charming town, rich in history and modernity, Otranto has made of the diversity of its cultures and of the beauty of its monuments a heritage of peculiar wealth and actuality. Thanks to its bastions, its Aragon Castle and the age-old cathedral with its astonishing mosaic, the town is a timeless place, where the ancient relics are blended with a dimension of modernity that today still remains unrivalled. The nature, inherent context of Otranto’s history, exists here in its own reality, still primitive and barely stirred by its contact, for as civil and moderate as it may be, with the inhabitants.